On Tuesday, the Conservative Party elected their 4th leader since John Major was defeated at the 1997 general election. David Cameron ran a faultless campaign that saw him come from seemingly nowhere to claim an outstanding victory. He beat his final round rival David Davies in a ballot of party members by a ratio of 2:1. As I have mentioned on this site before, I was once a staunch Conservative, but in recent years I have become more of a floating voter, and deserted the Conservatives for the first time this year, voting for the Lib Dems instead. So can David Cameron win me back? Whilst I still reserve judgement, I felt I needed to put into the public domain how impressed I have been during his first week of leadership, and the new direction he’s taking the party. His debut speech as leader was impressive (even if there was a tiny omission), and delivered in what is becoming his trademark style of no notes and Blairite postures. However what stood out the most was the promise of no more ‘Punch and Judy’ politics. That’s one hell of a sound-bite, and one I’d like to believe, but I can’t see it lasting that long. Fresh faced and fast paced, his public school background (well educated) and short time as an MP (still young and idealistic) are actually none issues for me. In fact David Cameron’s approach since Tuesday has been nothing short of breathtaking. Straight away wheels seem to have been put in motion—new logos and branding rolled out, changes to how the party works in the European Parliament, setting up of policy units, alongside a raft of visits to a number of community projects in which he showed a relaxed yet engaged attitude. The announcement of a policy group on the environment on only his first week in office really does show how much he wants to take the party forward and make it more relevant. On Thursday, following a brilliant debut in the commons at PMQs on Wednesday, he went onto announce his shadow cabinet. I think his choices, which includes former leader William Hague, as well as leadership contenders David Davies and Liam fox in key positions (Foreign, Home and Defence respectively) was an instant sign of getting down to business without holding any grudges. Another former leader Iain Duncan-Smith gets to head up a social justice policy unit, as does Ken Clarke (heading up a new democracy task force), who was also a leadership candidate. I don’t know the ins and outs of the Tory party but this seems to be a pretty wide church. However one note of caution, yet also optimism (as a designer) is that finally the Conservatives seem to have woken up to the idea of image. Cameron’s arrival immediately signalled a big change in how the party wants to be seen. The torch logo that was reinstated during this years election remains, but is now party hidden by a new (Labour?) slogan—“Change to Win, Win for Britain”. Harsh blues and reds have been replaced by pastel blues (and only blues) a lighter and more contemporary typeface and the use of softer photography. My only note of caution here is that I hope this isn’t an attempt to pull the same tricks used by New Labour, which was, and continues to be that of image, and little of substance. Of course a big question remains. 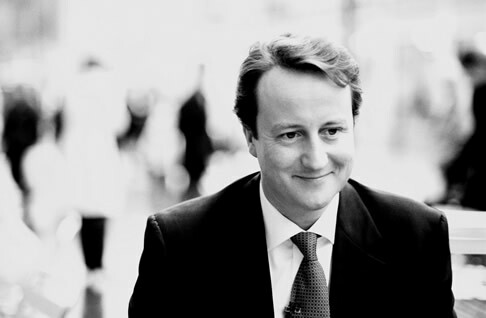 What does David Cameron stand for? Hopefully in the coming weeks and months we shall find out, but in during the last three days alone I have been mightily impressed.